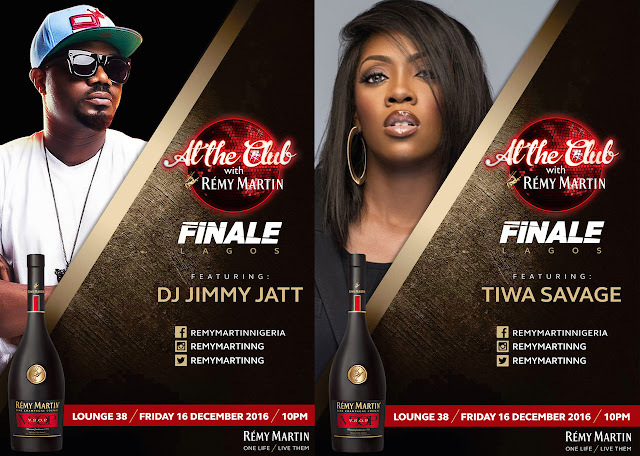 COOL DJ JIMMY JATT AND TIWA SAVAGE WILL BE SHUTTING DOWN SURULERE TODAY 16TH DEC.
Surulere fans will have the opportunity to see chanteuse; Tiwa Savage performing her smash hits this Friday at the new Lounge 38 (now on Bode Thomas). DJ Jimmy Jatt will also be on hand to spin the hottest records to 2016 to teeming guests so get your dancing shoes on. Starting in April, the club tour series has seen the like of Femi Kuti, Shina Peters, Falz, Runtown, Timaya, Patoranking to mention a few with superstar DJs Jimmy Jatt , Baggio and Neptune perform in 2016 from Lagos, Abuja, Port Harcourt, Owerrri, Ibadan and other parts of Nigeria. On the same night a dance crew will emerge winners of the highest rewarding dance competition – The Remy Martin Danceoff; this will see them walking away with a whopping N3 million and a trip to Abu Dhabi to attend a dance festival in January 2017.